Get dedicated medical attention from your personal doctor who knows your medical record and who’s available after hours or during weekends. 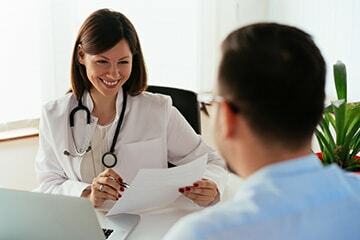 A condensed version of YourMD, which includes an annual comprehensive physical exam, follow-up appointment, and optional acute care appointment from your private doctor. Enjoy same-day or next-day, pay-per-visit appointments with your doctor. No more long waits, no rush. We bring professional healthcare services to home- or facility-bound patients. You’ll receive attentive medical services in the comfort of your everyday environment. YourMD was founded by William Pierce, Jr. M.D., formerly board certified for 17 years. He has successfully practiced Family Medicine for 18 years. With extensive experience in the field, Dr. Pierce has seen how frustrated patients get when they have to spend hours in a waiting room only to have just a few minutes to consult with a doctor who barely knows them. YourMD was established to offer a better solution. Our personalized medical care gives you a chance to spend enough time with a doctor who truly knows you, your special concerns, and your condition. At YourMD, we believe that good patient-doctor relationships can be beneficial for both. Time is important to me. My appointments are scheduled and I have the doctor waiting for me. There is no rush. Everything is explained in depth. Concierge Medicine/LA is an excellent choice for individuals seeking more personalized medical care.